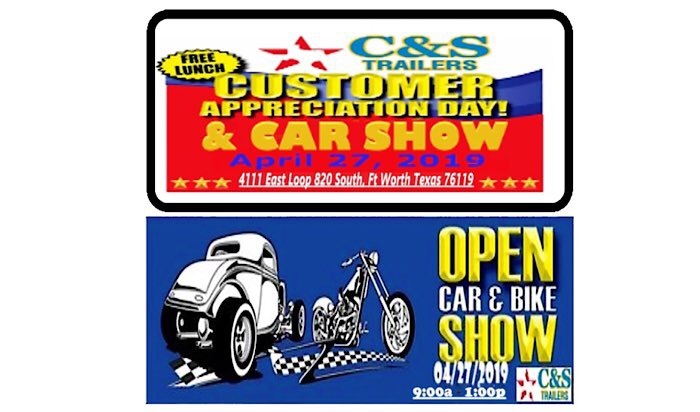 C&S Trailers is hosting our first Open Car Show on Saturday April 27 2019 (Rain or Shine) The event will be FREE to both Participants and Spectators, our gates will open at 7:30am but with limited space for participants please RSVP to tagg@cstrailers.com or Richard@cstrailers.com for a guaranteed spot. There will be cash prizes and plaques for the top three vehicles. We will have Food, Drinks and child friendly activities! We would love for everyone to join us!!! !